Initial Consultation At the beginning of every project, we sit down with the customer to map out a website plan. We determine the business' needs and tailor a website solution to meet those needs. Company Information Collection The first step in the project is to collect customer information, including company information, product information, services offered, key staff, directions, testimonials, news and contact information. Best Practice Research We research each company's key competitors to determine what type of web and social media presence they have. We incoporate the main features of the competitor's website, while adding new features to make the company's website stand out. Search Engine Research We also research where each company and their competitors rank on basic search keywords This provides the framework for the website's basic search engine optimization. Marketing Material Review The last step, just prior to the website design, is to review the company's marketing material - logo, business cards and print material. 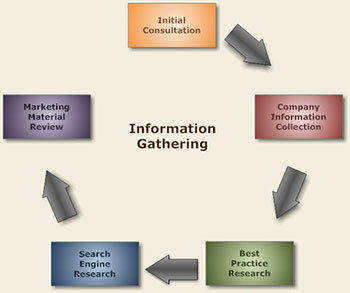 This provides us with a guide in developing the website by maintaining consistent colors and graphics.